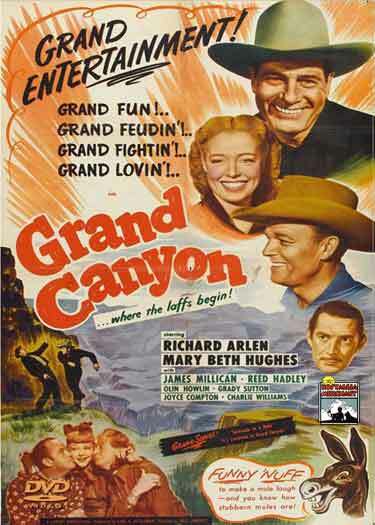 A film director is making a picture called ‘Grand Canyon” and goes to the Grand Canyon to shoot it. He meets and hires three mule-skinners to work for the company. Tex Hartford, the male lead is injured. and Mike Adams, one of the mule-wranglers is asked to play the part. Mike falls in love with the female star, Terry Lee, and this makes the already-unhappy Hartford even unhappier, and he resorts to finding ways to embarrass Mike and force him out of the film. 1949 – BW – 65 Min. Digitally Remastered. Grand Entertainment… Grand Fun… Grand Feudin… Grand Fighting… Grand Lovin!